ClearChoice polypropylene cartridges are best used for removing sediment from municipal water. Often used in under-sink (point-of-use) systems, pre-filtration for RO systems and post-filtration for granular activated carbon filters. 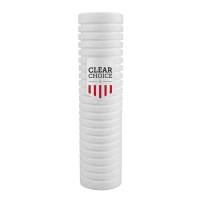 ClearChoice filters have gradient density for greater dirt holding, which traps large particles in the outer layers and smaller particles in the inner layers. Surface grooves increase the outer surface area for even greater dirt-holding capacity and a longer service life. They are also used in applications such as Ice Machines, Film Processing, Beverage, Coffee, Analytical, Wineries, and many others. Tested and Certified by NSF International to ANSI/NSF Standard 42.